This elegant teak case allows older iPhones to charge up wirelessly while protecting them from damage. 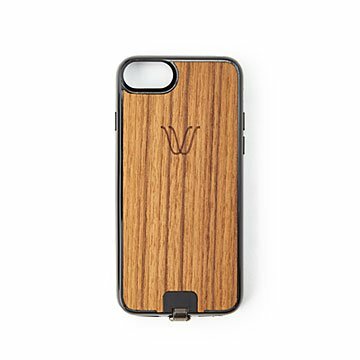 Made of handsome teak by Italian artisans, this slim, elegant case allows older iPhone models to power up wirelessly, just like the new kids on the Apple block. Its built-in, high-quality receiver enables you to top off your power conveniently at the wireless charging spots popping up at airports, hotels, and coffee shops. Of course, it does all the normal things a great case does, too: looks sharp, provides solid damage protection, and has slots for your headphones and a regular charging cable. Add our elegant matching Power Bank and never hunt for a cable again. Made in Italy.